The event is meant to serve as "a window to a marginalized landscape and an initiative to reclaim a people’s rights, dignity and freedom". A still from Marathi film 'Fandry', which will be screened at the festival. 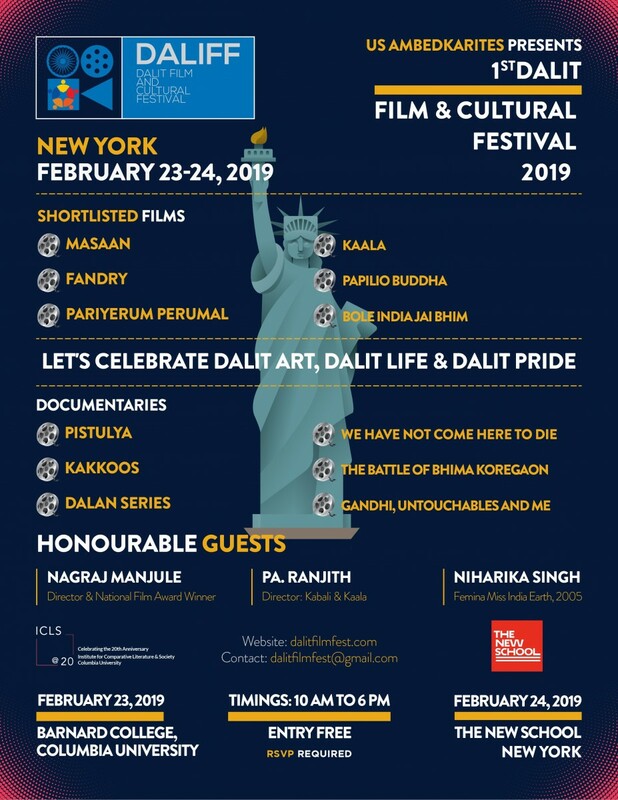 New Delhi: Ambedkarite groups in the United States have come together to organise the first Dalit Film and Cultural Festival in New York City, to be held on February 23 and 24. The organisers of the festival are the Ambedkar International Mission (USA), Ambedkar Association of North America, Boston Study Group and the Ambedkar Buddhist Association Texas. Barnard College, Columbia University and The New School, New York are co-hosting and sponsoring the event. “…we have shortlisted films from well-known Dalit filmmakers who have taken caste and class as a theme of exploration. These Dalit-centric films as well as documentaries directed and produced by Dalits offer nuanced, never-before-seen forms of Dalit society and culture. It is a window to a marginalized landscape and an initiative to reclaim a people’s rights, dignity and freedom,” the organisers said in a release. A poster for the festival. Well-known films such as Masaan, Fandry and Kaala, and documentaries including Kakoos, We Have Not Come Here to Die and others will be screened at the festival. In addition, a release announcing the festival says, art, literature and photography by Dalits will be showcased.